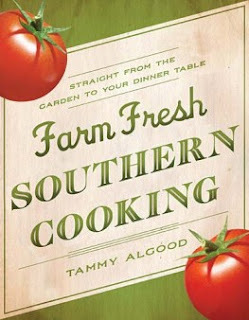 A Well-Seasoned Life: Review and Giveaway: "Farm Fresh Southern Cooking"
Review and Giveaway: "Farm Fresh Southern Cooking"
Preheat the oven to 350 degrees. Spread the pecans in a single layer on a jelly-roll pan. Drizzle with butter. Sprinkle with the bacon pieces evenly over the pecans. Bake 25 minutes or until the bacon is done, stirring occasionally. Meanwhile, in a small bowl, combine the sugar and salt. As soon as the pecans come out of the oven, sprinkle evenly with the sugar mixture. Cool on a wire rack. Serve at room temperature. Yields: 2 cups. Note: Store leftovers in the refrigerator and bring to room temperature before serving. So, do you think you might want a copy of this cookbook? I can guarantee that you will love it! This giveaway is open to my blog and Facebook followers. It's very easy for you to join these ranks. Just click follow on one (or more) options in the right-hand column of the blog. Once you've done that, please leave a comment below letting me know that you're interested in the cookbook. And, if you feel like it, let me know what fruits or veggies you're looking forward to the most this spring. Oh, and please leave an e-mail address where you can be reached if you're the lucky winner! I'm a facebook follower and I would love to win this cookbook. I can't wait for fresh tomatoes, cucumbers and squash from my garden this year. Excellent giveaway! I'm a google connect follower, and the fruit I'm most excited about getting my hands on would be big, juicy strawberries. I love, love, love them. Thanks for the opportunity to enter - I'd love to win a copy of this great book. Hi Kim! We usually have such similar preferences in cookbooks, so I'm really excited about the chance to win this one! I can't wait for some fresh tomatoes and corn on the cob! I am a facebook follower and I would LOVE the chance to own this cookbook. I can't wait for the fresh green beans and juicy tomatoes! I would love to win the cookbook. I follow you on FB and Google. I am a GFC Follower! I can't wait until my Mom's garden has zucchini! 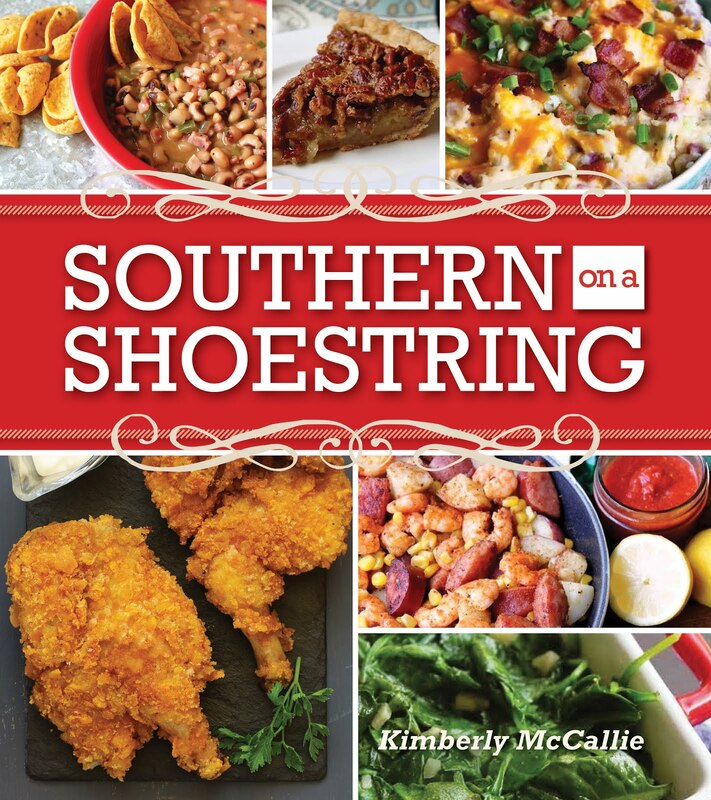 Oh Any Cook Book that is about the South...I WANT!! I cant wait for fresh Garden tomato's and Crisp Fresh Rhubarb! I'd love a new cookbook to check out! In the spring, I love asparagus, asparagus, and more asparagus. Oh, and I am a follower on Facebook. Beautifully simple-that's my kind of recipe. I'm looking forward to Romano Green beans fresh from the garden, and of course tomatoes! Haha, You told me to stop what I was doing and read your post. I guess that makes me a true follower. I'd love to win your cookbook because I am in a cooking rut. We have a new grandson (I'm 42)..that I am keeping a lot on my days off, therefore, I have not had time to be very creative lately. I need help!! The vegetable that I am looking forward to this year is different. I remember my mother cooking "creasy greens".. (or Cress, I looked them up) when I was a child. I didn't think much about them until now and I am craving them so much. She used to go out and pick them somewhere..? I am going to have to find out where I can get my hands on some. Maybe I will just grow them :-) Now that's southern! Enjoy your posts!! I'm a GFC follower! Great give away. The peacans sound down right decadent! I'd love this book. I'm most looking forward to fresh herbs from my herb garden! Hello, I am a new follower and follow on your blog. 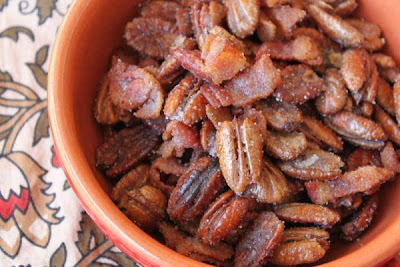 Tried and loved the pecans, may make them into a pecan pie because I love bacon in everything. Most excited about Strawberries and fresh vegetables from a small stand that still actively farms 2 acres of land right in the middle of the city of Indio ca. White corn coming soon as well. I'm a GFC Follower! I'd love this cookbook. I am excited for squash and zucchini. I'm a google connect follower, and the fruit I'm most excited about getting my hands on would be strawberries. Thanks for the opportunity to enter - I'd love to win a copy of this great book. I am a google follower. I am so looking forward to fresh garden tomatoes!! :) Thanks for the giveaway opportunity! follow on gfc & fb. i'm looking forward to strawberries (we're hitting the u-pick place this thurs), and tomatoes and eggplant. I always look forward to rhubarb & strawberries. Then in the garden,lettuce,cucumbers,summer squashes & of course, tomatoes. Later in the season, blueberries, peaches...apples & winter squashes. I love to cook, seems like I'm reading or thinking about food all the time, or watching food network & cooking network on TV. I would love to win the cookbook, I have many but always room for one more. I read them like most folks read novels. I follow you on Facebook and I would love to win this cookbook. Tomatoes fresh from the garden are what I am looking forward to the most. Can't wait to start canning tomatoes and salsa. Interested in the cookbook :) Excited for strawberries and tomatoes!! I follow both the blog and Facebook and am truly excited about this cookbook. As for which fruit/veggie I am most looking forward to....Well, what can I say? I love them all and am so ready for any and all of them, fresh from the garden! I believe I am following you through everything...I just never know where I will be at at any one time. Great giveaway and what an awesome looking cookbook. I love all fruits and veggies and just cant for the local produce stands to start setting up. I follow, GFC, Network Blogs, FB..I love your blog. I'm a Facebook follower! Would luv to win this cookbook as I look forward to all the fresh fruit and veggies this spring/ summer!